Of Dreams and Faith and Camp NaNoWriMo! In recent posts, I’ve been making vague mentions at a non-fiction project I’ve started. I’m happy to announce that I have an official title for my project: Of Dreams and Faith. As some of you know, I have another blog that I run by the same name. Both the blog and the book detail the journey of faith that God has taken me (and my family) on in my lifetime, but the book will go into greater detail and offer more of an autobiographical look at things, while the blog continues to chronicle our move to the Bay Area and the church plant – Canvas – that we are a part of. 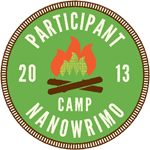 I’ve decided to participate in Camp NaNoWriMo. I have been doing the basic, November-based NaNoWriMo (National Novel Writing Month) for the last eight years, and I just found out about Camp NaNoWriMo, which is basically a July version of NaNoWriMo, only you can set the word-count goal yourself instead of having to abide by the 50,000 words. I will be setting my goal at 50,000 to start off with though, and then if I get to the middle of the month and have surpassed that, I will reevaluate my word-count goal. The novel I’ll be working on for Camp NaNoWriMo is my third Expired Reality novel, Dark Horizons. I had already done a draft of this novel for one of my November NaNoWriMo contests, but this manuscript needs a complete overall from beginning to end, now that I decided to incorporate my Black Earth writing style into the series. If there are any of you wanting to keep up on my word-count progress or participate in Camp NaNoWriMo yourself (it starts July 1st), here is a link to my profile there – DavidCorbin.